Inside a magic lantern resides a genie. The Genie looks exactly like the modern day Sidney. A king comes across the lantern and rubs it. Of course the Genie must appear and offer three wishes. In doing so he also sets ground rules for the King of what he cannot ask for. The King has everything needs and only wishes happiness for anyone who enters his kingdom. He realizes the Genie is not happy so uses one wish to wish him freedom. He also gives the grateful Genie one of his wishes. Genie tells him he won’t use his wish because from what he has seen wishes end up badly. He admits his only desire is to find true love. The King invites him to come and visit his palace. At the palace the Genie meets the King’s family. He introduces him to his daughter Snow and to his wife the Queen…me. Later that evening there is a feast. 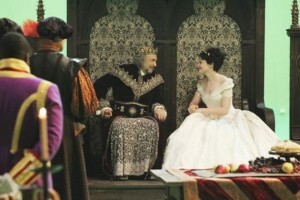 The King gives a speech for Snow about how wonderful she is and how much she reminds him of his first wife. She was the fairest in the land. I notice the Genie keeps staring at me. I cannot hide how upset the King’s speech has made me so I get up and walk outside. Genie follows me. We stand in front of my apple tree. I explain my sadness. Like this apple tree we are both trapped in a life at this castle and don’t belong here. I tell him I cannot please the King. The Genie gives me a gift in the form of a mirror and tells me that I am the fairest in the land. The next day the Genie enters the King’s chambers. The King tells him he has summoned him because he has read my diary and now knows that my heart belongs to another man. This man gave me a gift. The King admits to the Genie he will never love me the way he loved his first wife but does not accept my betrayal. The Genie is given a task to find the man who has my heart…the man who gave me the mirror. The Genie is outside and pulls an apple from the tree. My father arrives and frantically tells the Genie that he knows about us but the King does not. He gives him a box to bring to me to rescue me from the prison the King has placed me in. The Genie examines the key to the box. Once the Genie has come to see me I embrace him. I tell him how strong my love grows for him and it makes me so sad we cannot be together. He presents me with the box from my father. Inside there is a two headed snake. I tell the Genie I will allow it to bite me so that its poison may release me from my miserable life. The Genie stops me and tells me that for me he is willing to kill the King so we can be together. The King is asleep. The Genie enters his room with the box. He directs the viper to the King. The King opens his eyes to find the Genie standing over his bed. It is then that each side of the viper strikes the King. The Genie admits to the dying King he is the man who gave me the mirror. He also tells the King he is grateful that he had freed him but all he wanted was true love. As the King dies he tells the Genie he was right about the wishes. In my room I stare into the mirror. The Genie comes in and tells me we are free and can be together. I tell him that the palace guards know that the viper is from his native country and they are onto him that he murdered the King. I emphasize that we will never together and he must escape now by boat. He is upset and tells me I fooled him so that he would kill the King. He knows I never loved him. My tone changes as I lose patience. I tell him he killed the King which was what I wanted and I no longer have use for him. Again I tell him to leave. He grabs the lamp and makes a wish that we will be together forever. For a moment I am actually nervous until I realize nothing has happened to me. I hear him and it takes me a second to see it is coming from my mirror. The Genie is trapped in the mirror he has given me as a gift! I find this amusing and agree with him that it looks like we will be together forever. Henry and Emma are in front of a run down play house that was their “castle.” It is a mess from the storm. He shows Emma how he hid his book there so I would not find it. I show up and chastise Emma for letting Henry play by ruin. It’s dangerous! Emma and Mary Margaret chit chat at the Diner. Mary Margaret takes off very suddenly as her phone beeps. Sidney arrives and sits down with her. He tells her that I got him fired and he wants to expose me for what I am. He gives his card to Emma. Emma arrives to see Henry’s castle being demolished. He tells her his book is gone. She comes running over to confront me. Again I tell her that that area is dangerous. Once alone she pulls out Sideney’s card and calls him. She tells him she wants in. Mary Margaret and David are having a picnic in the forest. They kiss a lot. It looks like there is now a full blown affair. Emma drives through a tunnel to meet with Sidney. He tells her that $50,000 of the budget is missing and he believes I had embezzled it. He tells Emma to bug my phone and do what she has to do. She tells him she does not play dirty like that. Emma and Sidney are going through boxes of papers. Mary Margaret comes home. She agrees with Sidney that Emma must do whatever it takes to expose me. Emma and Sidney arrive at my office to confront me about missing money. Emma then tells me records of the money are now missing. I remind her of the fire and tell her perhaps they burned in there. Emma leans in and tells me she is leaving. Outside Sidney cannot believe she gave up so easily. She tells him she bugged my office as he had suggested. Later they are seen listening to whatever they can hear from the bug. They know I am meeting someone and it sounds to them like the meeting is for a payoff. They are excited and later follow me in the car. Emma loses control and they crash into a rock. Both of them are OK and believe I am onto them and did something to the breaks. They grab a flash light to do some searching and run into Mr. Gold. He tells them the meeting was with him because I am buying land from him. The next part of this plan is to break into my office. Sidney is uncomfortable with this. Emma reminds his that she is the police. The alarm sounds and they move quickly. Emma finds what she believes to be valuable information in my computer. She also finds a large set of keys and wonders what they open. I come in and ask what they are doing there. Emma says that there was a complaint some kids broke in. She tells me that Sidney happened to be nearby so she brought him as a witness. She offers to look around. I tell her it was obviously a prank and to leave. Henry is at the Diner writing down what he remembers of the stories. The Stranger asks him what he is writing. Henry asks him again why he is in Storybrooke. The Stranger tells him he has something to do here. Emma and Sidney find blue prints. Emma is reluctant to pursue this as she feels it is stooping to my level. Sidney encourages her. He shows her pictures of her and Henry in front of the castle before it was damaged by the storm. He admits I had paid him to follow them. Emma and Sidney burst into a city council meeting. They accuse me in front of everyone of stealing money to build myself a fancy home in the forest. I embarrass them when I show blue prints of how I am using that money to build a safe area for the children to play. Emma is speechless and Sidney looks disappointed. Mr. Gold sees them and tells them they need to do better to take me down. I confront Emma and tell her I know she broke in my office. She accuses me of messing around with her breaks. I deny this and tell her she is to stay away from Henry or I will file an official restraining order. Emma goes to see Henry at the new play ground but she stays in her yellow car. She talks to him by walkie talkie and explains that they need to cool it for awhile but she will continue searching for his book. He answers that he doesn’t think he will ever see it again. He watches her car drive off. Someone opens a box containing Henry’s missing book of fairy tales. It is the Stranger. Emma and Sidney have a drink at the Diner and he reminds her that she made an ally. Later Sidney is staring into a mirror at my office. We sit down and I grab an apple from a bowl of them. He plays me a recording of him and Emma talking as he assures her she has an ally. Emma now trusts him. I place my hand upon his leg as he stares at me like a love sick dog. I tell him I don’t know what I would do without him.